The evolution of digital tools is revolutionising urban design, planning and community engagement. 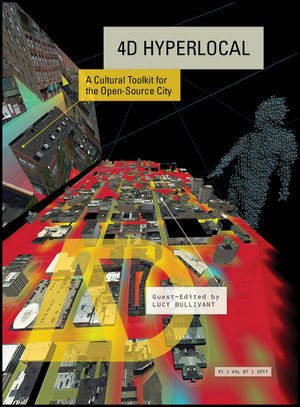 This is enabling a new ‘hyperlocal’ mode of design made possible by geolocation technologies and GPS-enabled mobile devices that support connectivity through open-source applications. Real-time analysis of environments and individuals’ input and feedback bring a new immediacy and responsiveness. Established linear design methods are being replaced by adaptable mapping processes, real-time data streams and experiential means, fostering more dynamic spatial analysis and public feedback. This shifts the emphasis in urban design from the creation of objects and spaces to collaboration with users, and from centralised to distributed participatory systems. Hyperlocal tools foster dynamic relational spatial analysis, making their deployment in urban and rural contexts challenged by transformation particularly significant. How can hyperlocal methods, solutions – including enterprise-driven uses of technology for bioclimatic design – and contexts influence each other and support the evolution of participatory architectural design? What issues, for example, arise from using real-time data to test scenarios and shape environments through 3D digital visualisation and simulation methods? What are the advantages of using GIS – with its integrative and visualising capacities and relational, flexible definition of scale – with GPS for multi-scalar mapping? Contributors: Saskia Beer, Moritz Behrens, John Bingham-Hall, Mark Burry, Will Gowland and Samantha Lee, Adam Greenfield, Usman Haque, Bess Krietemeyer, Laura Kurgan, Lev Manovich and Agustin Indaco, Claudia Pasquero and Marco Poletto, Raffaele Pe, José Luis de Vicente, Martijn de Waal, Michiel de Lange and Matthijs Bouw, Katharine Willis, and Alejandro Zaera-Polo. Featured architects and designers: AZPML, ecoLogicStudio, Foster + Partners, Interactive Design and Visualization Lab/Syracuse University Center of Excellence for Environmental Energy Systems, Software Studies Initiative/City University of New York (CUNY), Spatial Information Design Lab/Columbia University, Umbrellium, and Universal Assembly Unit. Lucy Bullivant Hon FRIBA is an author and curator. She is Adjunct Professor in Urban Design History and Theory at Syracuse University in London. In 2012 she founded her own webzine, Urbanista.org, on urban design. Formerly Heinz Curator of Architecture, Royal Academy of Arts, London, she has curated exhibitions for Vitra Design Museum, Triennale di Milan and the British Council. She is the author of eight books on contemporary architecture and urban design, including: Masterplanning Futures (Routledge, 2012) New Arcadians (Merrell, 2012), Responsive Environments (V&A Contemporary, 2006), Anglo Files: UK architecture’s rising generation (Thames & Hudson, 2005), 4dsocial (AD, 2007) and 4dspace (AD, 2005). Her next book is Recoded City: Co-Creating Urban Futures, with Thomas Ermacora (Routledge, May 2015). Lucy is also a correspondent to Domus (IT), The Plan (IT: Special Correspondent), Architectural Review, Architecture Today, Volume (NL) and Indesign (AUS: London Correspondent).